We are very excited to present you one of our newest additions for 2016: "Frozen 5-in1 Combo" Now your princess can have the perfect birthday party with Anna, Elsa, Olaf, Hans, and even Snev (the reindeer). This 5-in-1 combo style bounce house is the ultimate in inflatable jumpers! The large interior jumping area offers a basketball hoop and both log and pop-up obstacles. This bouncy castle has a climb feature and a convenient exit slide for hours of active fun! Parents and spectators are offered a clear view with the 360-degree mesh sides of this moonwalk. Don't wait any longer. 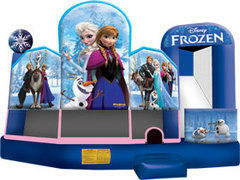 Book this brand new moon bounce for your next Frozen party! !